This sewer gas smell article describes how to get rid of or cure odors in buildings including septic or sewage or sewer gas smells or "gas odors" in buildings with a focus on homes with a private onsite septic tank but including tips for owners whose home is connected to a sewer system as well. Citation of this article by reference to this website and brief quotation for the sole purpose of review are permitted. Use of this information at other websites, in books or pamphlets for sale is reserved to the author. 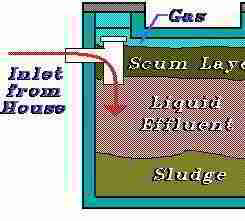 In a properly constructed drain-waste-vent system and septic tank installation, sewer gases produced in the septic tank find their easiest escape path back up through the scum layer and into the septic tank inlet tee and from there up the drain waste vent (DWV) system to the building plumbing vent stack system where gases are vented above the building roof. More septic or sewer gases may escape and make their way through the tank's outlet tee top into the soil absorption system where the gases are distributed over a larger (leachfield) area and further filtered and deodorized by the soil. Where a building is connected to a municipal sewer, the building drain-waste-vent system (DWV) includes traps and vents to be sure that any sewer gases passing back up waste lines are vented safely above the building roof. Watch out: as we warn in all of our sewer gas articles, because sewer gas contains methane gas (CH4) there is a risk of an explosion hazard or even fatal asphyxiation. Sewer gases also probably contain hydrogen sulfide gas (H2S) In addition some writers opine that there are possible health hazards from sewer gas exposure, such as a bacterial infection of the sinuses (which can occur due to any sinus irritation). Also see Wet Weather or Cold Weather Septic Odors or Sewage Odor Diagnosis & Repair Guide for additional odor tracing and cure advice for odors occurring during wet or cold weather. A variety of mistakes or just plain bad luck about site terrain shape and prevailing wind, or something more serious like a failing septic system can, however, produce sewer odors at a property. Here are some steps to diagnose and correct gas odors at properties served by septic systems. Some of these steps also apply to homes connected to a municipal sewer as well. At SEPTIC & CESSPOOL SAFETY we've already explained that gases produced in a septic tank are dangerous, as a potential source of explosion and as a cause of death by asphyxiation if someone falls into or deliberately enters a septic tank. The gases that form in septic tanks are primarily two, methane, CH4, and hydrogen sulfide H2S. It's the H2S (a "rotten egg" smell) that people mostly notice if gases from a sewage system are not properly vented at a building. Other gases produced by the decaying organic matter in the tank are also mixed into this brew as well. Experts [Burks/Minnis, Kahn et als, Jantrania] will tell readers that septic tanks and their covers and access covers and piping fittings should all be sealed air-tight with proper rubber gaskets. In nearly 50 years of looking at septic tanks and systems, I've rarely seen a conventional concrete tank which was sealed with gaskets. Some steel and certainly some of the newer fiberglass septic tanks may be in fact more precisely designed and built, but concrete septic tanks and covers are a bit rough and will be leaky in most installations. Acidic Septic Tank Problems can also cause odors: See Acidic septic tanks at SEPTIC or SEWER PIPING LEAKS for the diagnosis and cure of this source of sewage smells. Aerobic treatment unit septic system parts failure: an aerator pump or control valve failure can cause the ATU to emit septic smells and risks system damage or even failure - by the discharge of inadequately treated wastewater into the effluent disposal bed. Drain backups & sewage odors: blocked drain lines or vent pipes resulting in trap siphonage or sewer gas backups into the building can have as a component or even primary cause a failed septic system drainfield. A drainfield or soakaway bed failure in turn may be due to inadequate maintenance such as failure to pump or clean out the septic tank on schedule. Septic tank or sewer line leaks at any point in the system can discharge effluent or, depending on the leak location, may be a source of sewer gas leaks & odors. Sewer lines within a building may corrode at the top of the piping or may be cracked or damaged at a position hard to see but one that can be located by careful inspection and odor tracking. An example is at CAST IRON DRAIN LEAK, ODOR, REPAIR. Treatment chemicals misapplied or not used where required in some aerobic septic system designs or similar designs that require use of a disinfectant can result in system odors. Watch out: don't just go pouring bleach into a septic system and for disinfectant type septic designs be sure you are using the proper disinfectant. A blockage at the septic tank can cause sewer gases to back up into the building. Blockages at the tank range from very costly (a failing drainfield) to less costly (a blocked or damaged sewer line between the septic tank and the distribution box or drainfield), to least costly and repaired by normal maintenance (pumping the septic tank). How can pumping the septic tank cure a sewer gas odor? If the septic tank outlet baffle has become blocked by a too-thick floating scum layer or "pillow" then sewer gases may be backing up into the building through the incoming sewer line to the tank. At loose toilets that are not properly sealed to waste lines, often appearing at lowest floor toilets first but possibly appearing at any toilet that is not well sealed. Even a toilet that does not "rock" on the floor may have a crushed leaky wax ring sealing the toilet base to the waste pipe. If smells are worst around a particular toilet we suggest having your plumber remove and re-seal the toilet. At leaky or defective plumbing traps or plumbing vent lines - links below point to detailed articles on these topics. Continue reading at SEPTIC / SEWER ODOR SOURCE TABLE or select a topic from closely-related articles below, or see our complete INDEX to RELATED ARTICLES below. SEPTIC SYSTEM ODOR CURES at InspectApedia.com - online encyclopedia of building & environmental inspection, testing, diagnosis, repair, & problem prevention advice.